This work examined the effect of light source, illuminance and observer’s age on the ability to detect an obstacle simulating a raised paving slab, presented for 300 ms in six different positions relative to the line of fixation. The light sources used were the high pressure sodium, MASTER City White 942 (4200K) and MASTER CosmoWhite (2700K) discharge lamps. The illuminances used were 0.2, 2.0 and 20 lux, measured on the paving surface. These illuminances cover the range of those recommended for subsidiary streets and ensure the human visual system is operating in the mesopic state. Two age groups were used as observers, one group being less than 45 years of age and the other being more than 60 years of age. The positions of the obstacle varied from 0 to 42 degrees to the right of fixation and 8 to 23 degrees below fixation. 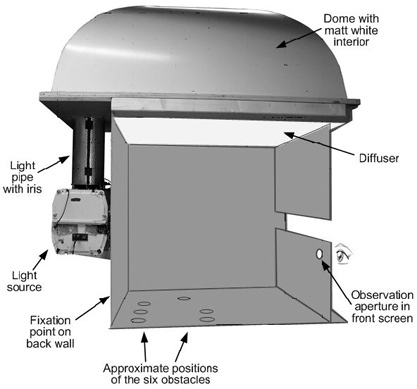 The figure below shows the test apparatus: this is a side elevation with the panel removed to expose the interior. 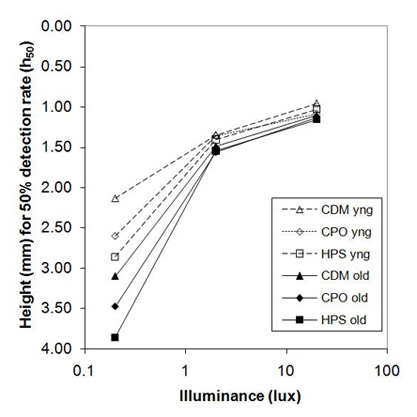 Obstacle detection was influenced by the illuminance, the 50% detection height being less at 20 lux than at 0.2 lux. At 0.2 lux, the 4200K MASTER City White light source gave the smallest 50% detection height while the high pressure sodium light source gave the largest. There were no statistically significant differences between the 50% percent detection heights for the three light sources at 2.0 and 20 lux. The young observers showed the smaller 50% detection height at 0.2 lux but at 20 lux there was no difference in 50% detection height for the two age groups.